Save Event: "Elegant Urban Decay"
The exhibition ?Elegant Urban Decay?, by Nyemike Onwuka at the arc Gallery is the first instalment of a series of exhibitions celebrating Nigeria?s 50th Independence anniversary. Nyemike Onwuka?s work draws its inspiration from the binary relationship/duality of beauty and decomposition. 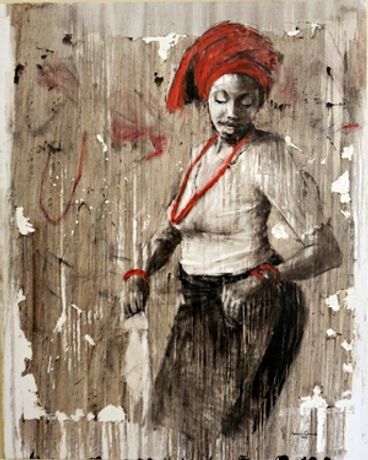 Women feature prominently in Onwuka?s body of work and within his paintings they are used to create a disjunction between the attractive subject(s) and artistic techniques that are not conventionally associated with beauty. Onwuka?s traditionally beautiful and elegant feminine bodies are juxtaposed with certain brashness and rusticity of brushstroke and in parts the burnishing of the painted image to reveal the canvas underneath. These deliberate disfiguring techniques accentuate the beauty of the subject against a naturally fragmented and decaying world, suggesting an urban decomposition with deft simplicity. Throughout his works Onwuka incorporates issues of storytelling and communication. The perceived interaction of masses brought together in light, shade and use of rustic colour endow his paintings with a strong narrative element. The Exhibition will run from Friday the 21st of May until Wednesday the 26th of May 2010.